"Mommy - do you have to go to work today?" Remember the good old days, when sourcing advisors mercilessly roamed the earth in search of inexperienced enterprise executives in desperate need of experts to get them through their outsourcing transactions? You'd a thought today's prospective buyer of outsourcing would be able to crunch some numbers, do some research and make some difficult decisions themselves. Obviously, with deal sizes shrinking and growth slowing in today's tentative market, more enterprises must surely be running their own deals? In this stinky economy, enterprises must be tightening the purse-strings and muddling through a lot of this stuff themselves. Of course they're not! Welcome to Corporate America and Corporate Whatever, where executives still want someone else to make their contentious decisions for them... oh, and do all the heavy-lifting too. So why, pray tell, are advisors in even greater demand in today's maturing and cautious market? Much more data is available, which simplifies the consulting process. 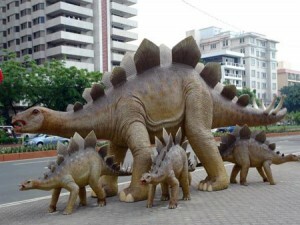 In the dino-sourcing days, some advisors would charge ridiculous sums of money to perform such tasks as drafting vendor profiles, averaging price benchmarks and crafting service levels. Not to mention the ridiculous science some of them developed around architecting business cases. Firstly, most of the research needed to support outsourcing down-selection and contracting is available off-the-shelf from analysts such as HfS (ahem). Secondly, most of today's contracts (sadly) are too frequently copied and pasted from each other, and new buyers can enjoy the same insane manifestation of SLAs and clauses that make little business sense, but make them feel they are going to get incredible provider performance, once the ink has dried. Most executives hate taking on onerous and resource intensive work-tasks. It never ceases to amaze me that the first thing every consultant has to do when he or she evaluates a BPO engagement, is to request the client documents their processes. And 90% of the time the consultant ends up doing it for the client (and bills another hundred grand for the privilege). And don't even get me started on running operational analysis, mapping out the workflows etc. External validation during an initial transaction can still be incredibly valuable. While people can claim that the whole outsourcing transaction process has become commodotized, there is still an enormous about of risk involved - and while less money needs be spent on many of the tasks mentioned above, having third party validation on selecting the right provider and getting a decent price can (and usually does) save millions - and a great deal of pain if a lousy service provider is selected. I recall a recent example where an advisor showed up at a client for two days and saved them $5m off the TCV of the contract and made sure they went with the best provider - and he only charged about $30K for the time and effort involved. 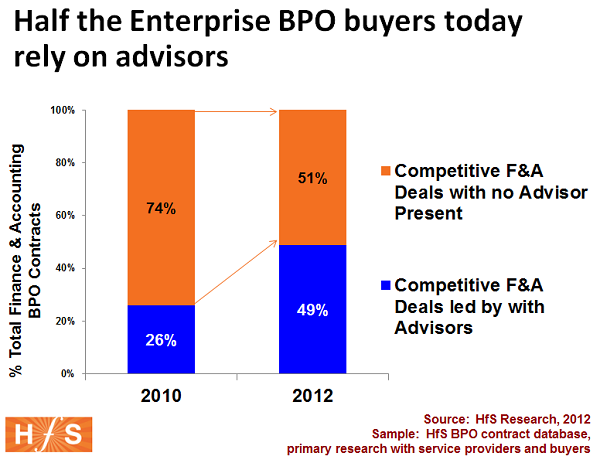 While the combination of increasing commodization of basic BPO services and an ever-smartening buyer, seemed to signal the end of transactional advisory services, the consulting industry has found a way to adapt to keep itself relevant and much more price-friendly, while still being in a strong position to help clients deal with the sensitive and political task of outsourcing. However, as the deals get smaller and the role of BPO proliferates into one vehicle of many for business operations leaders, the consulting community will need to increases its broader sourcing skill-set to deal with blended shared services/BPO models, and have a great degree of process knowledge and consulting finesse to deal with complex corporate situations. There's a reason why the likes of KMPG, McKinsey and PwC are in this space - they see the bigger picture that BPO transactional support is one arrow of many that they need in their quiver to help operations leaders with ever-increasing global needs to keep their companies competitive. Good run down of where we are today but I sit here wondering why we are still discussing the deal and few (if any) are thinking two to three steps beyond in terms of what guidance is really necessary for a customer to develop sustainability and providers to offer the right matched set of cooperative services to make this beyond the routine. Something more is going on here. Definitely worth a bit more digging on both the scale of Advisor support and nature to see if this is evolving. Are there components - for example SLA definition - that are very commoditised and hence no longer included as part of the advisor deal? Also what is the impact of 'serial implementors' - Contractors who have done this a number of times before becoming embedded in organisations and bringing much of the knowledge and skills provided by advisors. Are they part of this increase? @Roy - my take is that the guys doing sourcing advisory are addicted to it, and don't really want to do anything else. Their only other career choice is to work for vendors on the other other side of he negotiating table. These advisors have adapted to smaller deals and are performing their craft faster/quicker and cheaper. Let's also not get too carried away - there were only 99 F&A deals of the last year, so in reality we're only talking about 50 engagements and probably a further 20-odd which never reached contract. I will admit to enjoying my role (I'm an independent consultant on outsourcing).... addicted? Perhaps. One of the aspects of advisors that you touched on is their independence. This is one of their core sell-points. During the tendering process the customer and the provider might have trouble admitting hard realities. The customer's organisation will often have difficulty opening up to the current performance of their processes, even if the executive team do point to a "Here be dragons" on their process maps. This will be even moreso when the people doing the 'prying' are a service provider looking to deliver better than the current organisation. This will be the same service provider that is eager to show their capability in the process area in question, and who will therefore often overplay their hand and brush-aside possible risks and issues with the processes in question. A decent independent advisor can be trusted to raise red flags quickly, because he/she has no invested pride in the current state of affairs, nor a need to demonstrate their capabilities to win business. You also identify that increasingly the advisor has more feathers in their cap and can therefore provide further consulting to the customer. In my experience the advisor on sourcing is often part of a team (sometimes of one) that is consulting on the entire exercise. Many organisations use the process of outsourcing to address issues in their organisation; the thought being that the rigour required to deliver contract will expose the skeletons in the closet and force the addressing of them. With that in mind over here in Europe, the most common message I receive is "we don't know how to do this BPO stuff, and we don't trust the providers to help us". Rightly or wrongly many potential customers feel that asking the provider to treat them tenderly during the tender is like asking the wolf to guard the sheep. I might be inclined to agree. The providers are heading towards commoditising BPO, but many of the customers aren't there, yet, with a ready and willing plug-&-play interface. My feeling is that the advisors are often part of an overall approach by potential customers on the transformation they are undergoing. Oh, and "new buyers can enjoy the same insane manifestation of SLAs and clauses that make little business sense, but make them feel they are going to get incredible provider performance, once the ink has dried." Brilliant, still laughing now. I have been curious about one thing in this business - is there any level of automation and innovation in the sourcing advisory business ? Advisors tend to advice clients about asking providers for innovation. Succeeding in shared services requires clear objectives and good governance | ProcessGo! In simpler explanation, outsourcing is beneficial to businesses. We are the team who can be an extra hands for everyone, making their goals more reachable, doubles the company's productivity and opens more opportunities. And we believe that these are what every company needs.